Local schools are back in session next week. There are pops of yellow in the trees and fireweed blossoms have reached the top. With more darkness noticeable each day, we are eager to find ways to cling to the very last nuggets of summer. Of course, I love to do this by getting summer on the plate, highlighting the fleeting flavors of the season. Some might say, especially anyone with Italian roots, that caprese is the taste of summer — that classic combination of fresh mozzarella with slices of ripe tomatoes and leaves of basil, usually drizzled with good extra virgin olive oil and balsamic. There's a magical quality about it that captures what a summer day at the farmer's market tastes like in one perfect bite. I like to mix up my caprese by swapping out the tomatoes for nectarines or other stone fruit that will be disappearing soon from the market and adding some salty prosciutto. Then I put it all on bruschetta, the Italian way of saying toast with olive oil and often garlic, other toppings welcome. 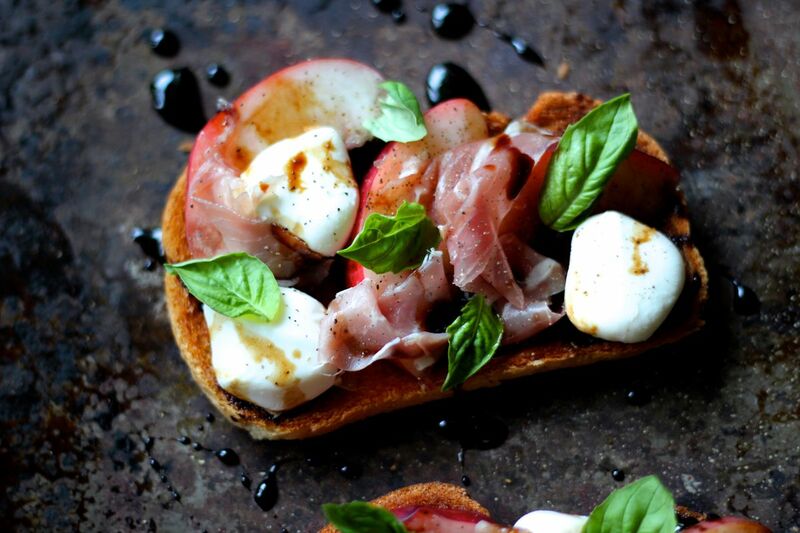 This bruschetta with nectarines and prosciutto drizzled with balsamic makes a stunning appetizer, lunch, or light dinner as we bid farewell to another spectacular Alaska summer. To a saucepan over low heat, add the balsamic vinegar. Bring to a simmer and allow to reduce until it is thicker enough to coat a spoon, about 3 minutes. Turn off the heat and set aside. Preheat your broiler to high. Place the slices of Italian bread on a rimmed sheet pan. Drizzle each slice of bread evenly with olive oil. Toast the bread under the broiler until golden brown, watching it carefully. Remove the bread from the oven and rub the cut-side of sliced garlic across the toasted side of each slice of bread. Place three balls of mozzarella onto the hot toast. Lay 2-3 slices of nectarine onto each piece of bread. Distribute the strips of prosciutto evenly on each. Sprinkle with fresh basil leaves. Using a spoon, drizzle each piece of bruschetta with the balsamic reduction. Season with salt and pepper to taste. Serve promptly while warm.